This April the Philadelphia Zoo opened KidZooU, a family education center and children’s zoo focused on conservation, sustainability, and living in harmony with the natural world. In an effort to create an interactive environment that exemplifies these values, the new building is decked out with all the latest in sustainable design and is hoping to get a silver L.E.E.D. (Leadership in Energy & Environmental Design) rating. 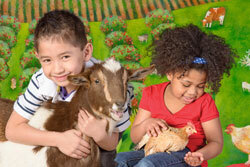 Though the outdoor population of barnyard animals might suggest a typical petting zoo, KidZooU goes above and beyond to create a comprehensive educational experience that is fun, interactive, and challenging. The sheep, goats and chickens outside are rare and endangered breeds that are an important part of the Philadelphia Zoo’s preservation efforts. Indoor exhibits connect endangered species to acts of conservation. Watch Australian budgies (parakeets) and learn how to help them by recycling. Find out how to save energy and water in your home and see how it helps marine wildlife. “We aim to teach our visitors that saving energy saves wildlife by demonstrating everyday sustainability actions and linking these actions to saving species,” says Margaret De Gennaro, communications coordinator at the zoo. The building features green design elements including geothermal wells for heating and cooling, rain gardens to reduce water runoff, daylighting and automatic turn-off lights, and rain collection for grey water flushing at the public toilets. The outdoor stables are built from recovered wood and have green roofs. The zoo recycled over 95% of the materials salvaged from demolition of the previous building and used many recycled in the new construction. “This construction project makes our organization-wide sustainability efforts visible to the public, allowing us to lead by example,” says DeGennaro. The exhibits which focus on conservation include both an explanation of the KidZooU building design and suggestions on how kids can create changes to conserve water and energy in their own homes. In addition to sustainable design, the building also incorporates principles of Universal Design, making the physical and educational content accessible to a wide variety of abilities and communication methods. All throughout KidZooU are colorful identification graphics for the animals and exhibits including Braille, American Sign Language, QR codes for foreign languages, and KidZooUPix symbols for individuals on the Autism spectrum. The multisensory exhibits and wheelchair accessible facilities mean that all kids can have a great time. KidZooU operates during all Zoo hours, 9:30-5pm now through October 31 and is included in the price of admission. Learn more at the KidZooU website. Sarah E Adams is the editorial intern at Grid and can also be found working for Bennett Compost at a farmer’s market near you.